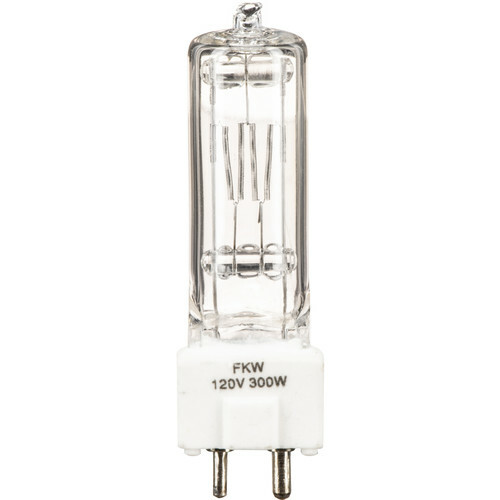 The Impact FKW Lamp (300W, 120V) is a clear bi-post base halogen bulb. It fits many stage, film and photography lighting fixtures. Box Dimensions (LxWxH) 4.8 x 1.3 x 1.2"
FKW Lamp (300W, 120V) is rated 4.6 out of 5 by 24. Rated 2 out of 5 by Justin from Brightness is good, but I can't get 100 hours out of them. I did a comparison of multiple 300 W fresnel bulb providers, and concluded that Impact seemed most consistent w/ brightness and temperature. However, I'm going broke replacing them. I currently use (6) 350W Arri lights. I brought 8 bulbs in January, another 6 toward the end of February. my last spare just died... I don't manhandle these lights by any means. Nor do i touch the bulb with bare skin. the last bulb i replaced had been in use since 2/15, It has only about 65 hours of use. I have tested our electrical grid and have not found any anomalies. Signs are pointing to the bulbs. Rated 5 out of 5 by NOVA Digital Films from Must have for Arri 650 As an alternate to the 650W bulb in an Arri 650, this lets you dual-purpose that light. With the wider fresnel than an Arri 300 the light is a little softer on a subject and given that the price difference between the Arri 650 and 300 are negligible, this makes your light kit quite a bit more flexible. Rated 5 out of 5 by Spirit Juice Studios from Now my Arri produces light! Prior to owning this product, my Arri 300w was an expensive paperweight. With the addition of a lamp, the fixture actually produces light via the lamp! Rated 5 out of 5 by Doug from 300 Watts of Tungsten Sunshine I've been using my ARRI Fresnel 300 Plus for 8 years predominantly as a rim light. Hard to believe that I got 8 years out of a single lamp. I just ordered a small batch of 300 watt replacement lamps. The Impact lamp is 300 watts of tungsten sunshine. It matches the color temperature of all of my other lamps and it works well for indoor shoots. Rated 5 out of 5 by DCP Productions from Fits & Works & Got here faster than expe I can't complain about this at all. This bulb got here quickly and the image was an exact amtch to the bulb I pulled out of my light. I will definitely order from here again. Rated 5 out of 5 by Brandon from Works w/ ARRI 300w Had to replace the bulb in this fixture twice for different reasons. Fits nicely and performs just as well as the bulb that came with the fixture from the factory. Rated 5 out of 5 by Outback from Great color, it works Bought two of these after the cheap bulb that came in my Spot Light blew. It works and has great color. I cannot speak for the lifespan, however.